The face goes through many changes as we age, and these changes can start very early. Aside from aging, some people are born with varying volume deficiency in some facial areas they decide to correct even before age changes begin. To get the best outcome, it’s important to not just assume you only need to correct a single compartment that supports the skin, when you may actually need several compartments filled to keep the visual “flow”. It’s possible to create more imbalance than correct it if you aren’t viewing the entire face as one completed puzzle. For instance, the temple area can play a huge part in facial balance. Hollowed temples above newly augmented cheeks could make your face look quite odd. How do you decide what’s out of synch? Is my facial shape in balance? One way to get a better feel for your own facial balance is to trace the outline of a photograph of your face from frontal and profile views. 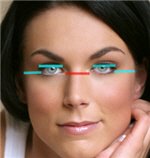 Is your face an inverted triangle? Does one side look higher, wider, than the other? If your temple area is thinner than the cheek area, you may discover that a rebalance in the temples first will provide the right framework for further augmentation in the lower parts of the face. If cheek augmentation is all that’s needed, then Radiesse is certainly an immediate and fairly long term way to address that issue. Recent development of cheek-specific Voluma is a wow option! Sculptra has the capacity to change the facial balance in a way Radiesse or other fillers cannot; and instead of relying on implanted material, stimulates your own collagen to produce the “augmentation” effect. Restylane Lyft gives a soft and less chiseled appearance; but if you decide you didn’t really need an augmentation after all, it can be dissolved.